A crowbar smashes into the sign for a “colored” washroom, tearing it from the wall. A piece of chalk passes from a white man’s hand to a black woman at a classified NASA briefing, where there was previously no protocol for women attending, let alone people of colour. These are two of the most powerfully symbolic images in Hidden Figures, an empowering and inspiring film that understands the importance of small victories in terms of breaking down barriers that stand in the way of true equality. The film shows how many of these small victories had to take place to propel forward the civil rights movement as a whole. 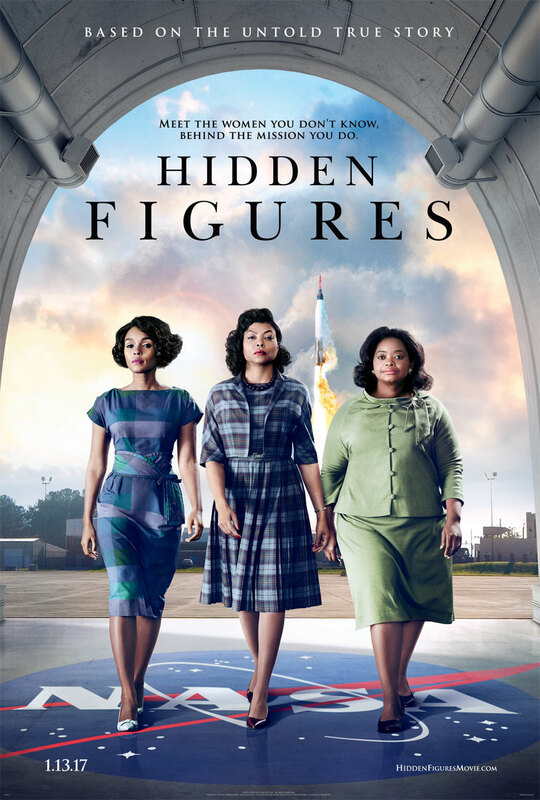 This is the true story of brilliant mathematicians Katherine G. Johnson (Taraji P. Henson), Dorothy Vaughan (Octavia Spencer) and Mary Jackson (Janelle Monáe), three of the black women who were instrumental in doing the calculations for NASA that allowed John Glenn (Glen Powell) to become the first American to orbit the Earth. But they had to fight to get the respect they deserved, at a time when segregation was still being practised in Virginia, and Russia was closing in on the space race. They gain the support and respect of some, most notably Katherine’s boss Al Harrison (Kevin Costner), who treats her as an equal amongst his team of white men and automatically recognizes the accuracy of her calculations. But others like her arrogant coworker Paul Stafford (Jim Parsons) view her with a thinly veiled disrespect, offended by the fact that his work has to be double checked by a black woman, and battling to keep his place as the smartest one in the room. The film shows how far these women have to go to prove themselves and gain respect just because of their gender and skin colour, despite being more qualified than many of their counterparts. They have to fight the system to get ahead. Fearing that her job is at risk by the giant IBM machine that has just been brought in, Dorothy teaches herself computer coding to ensure job security for the future. Mary doesn’t have the engineering degree she needs to move up at NASA, so she fights the court to allow her to take night classes at a segregated school in order to pursue her degree. Director Theodore Melfi builds this as a character drama first and foremost, showing the human factors behind all of these obstacles that stood in the way of equality. The film also works in a charming love story between Katherine and Colonel Jim Johnson (Mahershala Ali). The entire cast is rock solid, built around a trio of excellent performances by Taraji P. Henson, Octavia Spencer and Janelle Monae, who all do standout work on their own and also share wonderful chemistry together. The production design and costumes transport us to the world of the 1960s, and the soundtrack is vibrant and really adds to the film, featuring a selection of new songs by Pharrell Williams. This is an inspiring, feel good film that also shares an incredibly important and sadly little known true story that now feels more relevant than ever. These women deserve to be more than just a footnote in history, and Hidden Figures rightfully propels them to being the stars of this story, showing them as instrumental figures in helping America reach for the stars. And with the box office numbers that the film is currently doing, it’s clear people want to hear their story. Based on a true story, Hidden Figures tells the unknown history of the three African American women who were integral to helping with the mathematical data needed for the success of NASA’s first space missions. 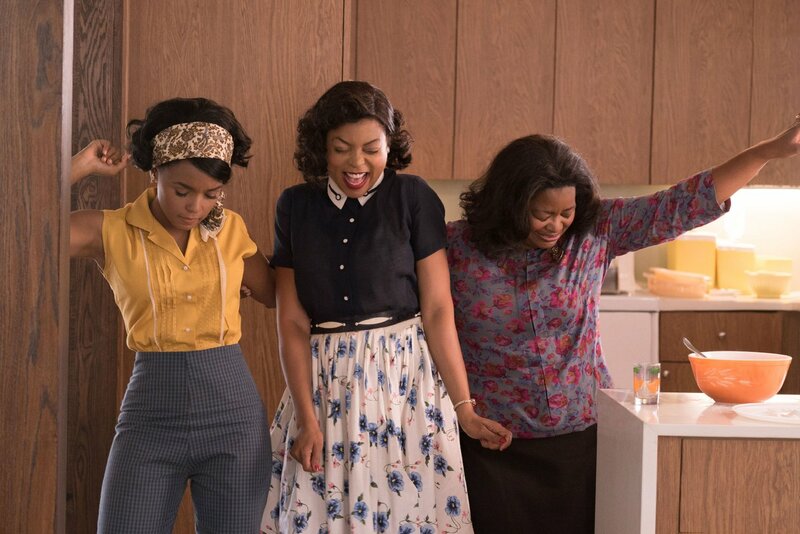 When the film opens, we meet our three protagonists – Mary Jackson (Janelle Monáe), Dorothy Vaughan (Octavia Spencer), and Katherine G. Johnson (Taraji P. Henson) – on their way to their job at NASA as part of the ‘colored computers’ department. Working separately, in their own building even, the ‘colored computers’ team worked to process complicated math data that trickled down from the other teams. When a specialist is needed to help figure out a mathematical formula for launch and landing, the higher up staff struggle to find any of the white males who can handle the level of data they need to process. So faced with no other choice, (lest they lose the space race to the Russians), Katherine G. Johnson is called up, and suddenly finds herself crossing gender and race lines to work as the only person of colour in a room full of white men. At this point, all of the math is still being done by hand, while the new IBM machine, (which is essentially a giant computerized calculator and takes up a whole room), is still being set up. Dorothy Vaughan takes an interest in the machine and has an ability to latch onto the building blocks of coding to help get it up and running, which she teaches herself and the other ‘colored computers’ in an effort to protect her job and those of her team. Meanwhile, Mary Jackson is being called upon for her engineering skills to work on the material for the outside of space shuttle. Her engineering skills are brilliant, but she is being denied a permanent position in the department due to not having an engineering degree (which is inaccessible since the schools providing it are still segregated). Each of the three women face discrimination and blockades as they try to do their jobs in positions that many still don’t think they should have. Be it Vaughan’s legitimate fear that the jobs of her team will be the first to go when the IBM runs, Jackson’s denial of access to an engineering degree, or Johnson’s direct discrimination she encounters from the employees she works alongside – in particular from fellow mathematician Paul Stafford (Jim Parsons), an arrogant and jealous man who seems to detest the fact that Jackson just might be smarter than he is – they fight to both do their jobs and prove themselves at the same time. There are some on the women’s side though, in particular Al Harrison (Kevin Costner), the manager of Jackson’s department, who values her calculations and is quick to come to her defence when the other members of the team try to devalue from her work. The film very much illustrates a time when things were shifting, and these three remarkable individuals were fighting under the radar of the public eye to make a real difference in the accomplishments of women and African Americans to finally be respected and recognized in the field of science and math. The film feels way shorter than its 2 hours, 7 minutes, and is an entertaining, empowering, and exhilarating film that provides just the right mix of humour, drama, and commentary. The cast are all exemplary in their roles, and the soundtrack by Pharrell (also a producer on the film) really sets the tone. Doing huge numbers at the box office, Hidden Figures is deserving of the attention it is getting – be sure to catch this one, and keep an eye on it (and its cast) as we move through awards season. 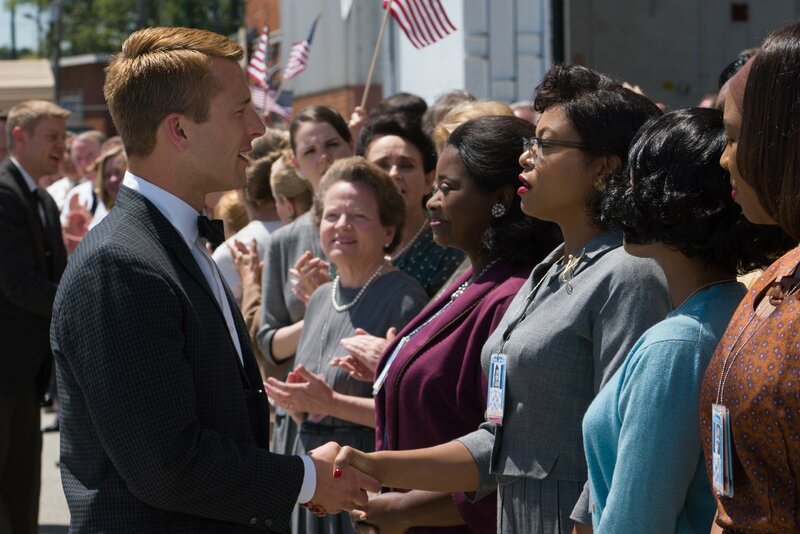 Hidden Figures is based on the true story of the women known as “colored computers” who were indispensable to the 1960s U.S. space program, focusing on the careers of the three most notable among them. Dorothy Vaughan (Octavia Spencer) was the acting supervisor of the pool of “colored” women tasked with routine calculations though she was not given the title, much less the pay of a supervisor. She took orders from her white counterpart (Kirsten Dunst) on the main campus of NASA’s Langley, VA research center and brought them back to her building on the western fringe of the campus still segregated in early 1960s Virginia. When she noticed that an early IBM mainframe was being installed, she learned and taught her workers coding so they could keep their jobs. By the way, that room-filling computer was about 100 thousand times slower than a smart phone. Mary Jackson (Janelle Monáe), assigned to the spacecraft design area, had a flair for aeronautical engineering but had to fight to get into segregated classes to earn her degree. I can recall the foreboding felt as a small kid looking up at our summer cottage in 1957 as the first Russian Sputnik satellite streaked by, only slightly comforted by the “duck and cover” drills that were supposed to protect us from the looming nuclear holocaust. With apocryphal stories that tenth grade Russians knew as much as our university graduates, science curricula were upgraded in North America, from which I benefited, both as a student and later teacher. I followed the space program that included a significant contribution from Canadian engineers laid off from the Avro Arrow fighter jet program. In 1969 I stood in a crowd of almost all white male engineering faculty and students watching the moon landing on a small B/W TV set. Outside of NASA the pivotal roles of “colored computers” would remain unknown for decades. For me, Hidden Figures was an inspiration and delight from beginning to end. Everyone involved in the project was obviously deeply committed to the story. Theodore Melfi turned down Spider-Man to direct it. Pharrell Williams, who was a producer and provided much of the brilliant period music, grew up as a space buff near Langley. NASA was particularly generous in their technical support. The script is full of wit and charm, brought to life by the excellent cast. In particular, T.P. Henson, almost unrecognizable with her 1960s hairdo, pointy glasses, thick dark lipstick and high voice, is outstanding, given the additional obligation of honouring her real-life counterpart, still alive and brilliant at 98 years of age.